The term log monitor is a general term referring to different programs that all perform automated monitoring of various kinds, keeping track of changes to a file or file system. This is especially useful for administrators who have to stay on top of a large network consisting of databases, file systems, and many different programs running all at once. Even for single computer users, these monitoring programs can prove useful to provide a high level of control over an operating system&apos;s activities. Our log monitor also comes with built-in notification or even scripting capabilities. That is, in the case that anything remarkable is found in any of the logs that the program is currently monitoring, it could simply send off an email to the human administrator, or even perform a preprogrammed response. This saves administrators a lot of tedious labor in looking through many different logs, and frees their time for more important and complex administration tasks. 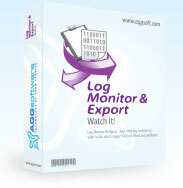 What problems can be solved with Log Monitor & Export? A good example of a case wherein a monitoring program can save an administrator a lot of hassle is with a large file system open to many users. Keeping track of directory changes, new files, file name changes, and so on would be nearly impossible without using a specialized program designed to do so. By setting a few basic rules, for instance, restricting file types to particular folders, or restricting access to certain directories, an administrator can keep the entire system in tip-top shape. Getting started is easy. Log Monitor & Export is ready! After installation start Log Monitor from the Start Menu. Click the green plus button and choose options for log files and folders with log files. Then define how you want the log data to be parsed and exported. Our Log Monitor is based on an engine of our favorite data logger software and therefore inherits all base features of this software. Various OS. Works on all Windows versions 9x/Me/NT/2000/XP/Vista, including x86 and x64 platforms. Windows service mode. Unlike most other log monitoring applications, our Log Monitor can run as a service so that it starts as soon as the operating system starts and doesn't require a user to log in and run it. It will continue to run even as users logon and logoff the workstation. It is extremely easy to use! The configuration process is fully menu driven and has complete, context sensitive, on-line help. You can easily customize all input to your exact specifications. Once you see how easy it is to use Log Monitor & Export, you will never again take data readings by hand!